To see Sea Breezes in it's entirety, be sure to watch the video located at the very end of the photo gallery. 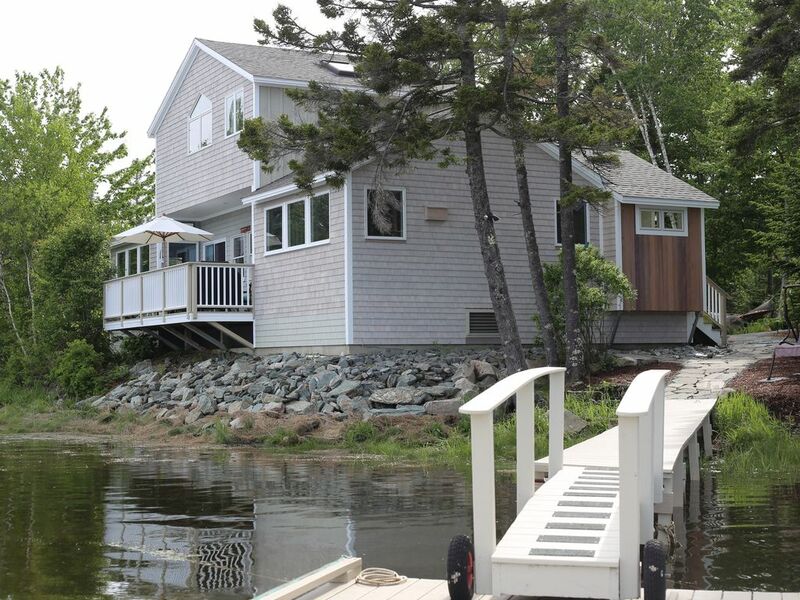 Sea Breezes, formally known as the Cohen Cottage is a two-bedroom cottage directly on the shore with 3 baths. One bath has a shower and a washer/dryer; one has a two person shower and the third is single person shower. There is a king suite on the first floor with flat screen TV and two twins in the upstairs bedroom. A sleep-sofa is available in the living area for a maximum occupancy of six. The cottage faces east which makes morning coffee on the deck, overlooking the water, delightful. There is a shared dock with two other cottages with row boat and tandem kayak at the water's edge for our tenants use. Master, first floor bath has 2 shower heads. Second floor bath has a single shower head. First floor laundry bath has a single shower head. Kayak right at house shared with two cottages. A variety of life preservers on site. Beautiful amazing cottage with all the amenities you could ever want. Perfection. Loved the high quality artwork. Great location and quiet! The house was super clean and well stocked. if you want to stay on the quiet side of MDI then this place is for you. it's on the water. beautiful sunrises and wildlife abounds. just perfect. the house is new and set up perfectly. Everything was clean and comfortable! We had a fabulous vacation. The Owenses were easy to contact and promptly addressed our concerns (tv access). I would stay here again. If I can think of any one thing that would enhance the property, it would be a screened in or partially screened in area on that fabulous deck. The mosquitoes thwarted our relaxation. Thank you for your review Gail. So happy you and your friends enjoyed your stay. I know you were really looking forward to your reunion. I am happy to pass your suggestion to the owner's. We hope you will be joining us again in future travels. Great base to explore Acadia and MDI from. Or if you just want to relax you can hang out on the deck, take a snooze on one of the hammocks or take one of the kayaks, canoes or rowboat out on the harbor. The whole property is very clean and well maintained. No shoes in the house! Appliance are all fairly new and work very well. Would definitely come again and would recommend to family and friends.